At Ironbark Timber, we stock tens of thousands meters of decking, including species like Spotted Gum, Ironbark, Yellow Balau, Merbau/Kwila, Pacific Jarrah, New Guinea Teak (Vitex) and more. Other species can be sourced as required. You’ll find a range of practical sizes, including 42×19, 70×19, 90×19, 140×19, 140×25 and 140×32. Available in 90×35, 120×35, 140×35, 140×45, 170×45 and 190×45, these decking boards are available in a range of different species. We can include anti-cup rebating and can grade at mill with heart side down. Boards can be delivered with a dressed top or sawn top to achieve R11 slip ratings. We also stock a complete range of KD 27 Class 1 (Above Ground) dressed and pencil-rounded Merbau in sizes 68×31, 90×42, 140×19, 140×25, 140×32, 140×42, 190x42m, 190×42, 240×42 and 90×90. Please note, these are all solids not laminated. The 115×115, 140×140 and 190×190 are Laminated /Finger-Jointed. At Ironbark Timbers we try and source the majority of our Rougher Header pine F7 and MGP10 CCA H3 products from New Zealand, as their steaming process before pressure treatment seems to achieve better chemical penetration. These are available sized 45×19, 45×35, 70×35, 90×35, 140×35, 190×35, 70×45, 90×45, 140×45, 190×45, 240×45 and 90×90, in common lengths of 3.6m, 4.2m, 4.8, 5.4m and 6.0m. Please note that not all sizes are available in every length – please check with the crew at Ironbark before ordering. 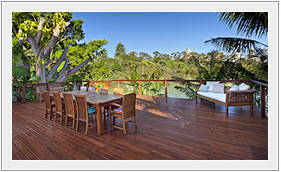 Choose from a range of Tan-E H4 Hardwood sleepers in sizes 200×50, 200×75, 200×100 and lengths of 1.8m, 2.4m and 3.0m. These are Queensland-cut Royal species, predominately Ironbark, Spotted Gum, Grey Gum and other Class 1 & 2 inground rated species. CCA treated Pine sleepers 200×50 are available in 1.8m, 2.4m, 3.0m, 3.6m and 4.8m. The 200×75 size comes in 1.8m, 2.4m and 3.0m lengths. The new 200×50 in 2.4m and 3.0m comes pre-arrissed to 4 sides and docked to lengths. ACQ/ Tan-E Pine sleepers can be cut to order if required. Treated pine H4 garden edging is available in 100×15, 100×25,150×25, 200×25 in 4.8m lengths. It’s important to note that all our hardwood fencing materials are Tan-E treated, not CCA treated, so hardwood can be used in all exposed applications. Posts are available as 100×75 or 100×100 size in lengths of 1.8m, 2.4m or 3.0m. Rails comes in three sizes – 75×38, 100×38, 100×50 in 4.8m lengths. Palings (100×16 size) are available in 1.2m, 1.5m, 1.8m, 2.1m and 2.4m. We have CCA pine fencing rails in stock in sizes 75×38, 100×38 and 100×50 in 4.8m or 6.0m lengths. Pine palings come in 100×16 size, in your choice of 1.2m, 1.5m, 1.8m, 2.1m and 2.4m. Our 1.8m pine palings are sourced from Bathurst in NSW and are dried and mould-free. Ironbark Timber also stocks hardwood rural fencing, split posts and round posts, also sap-treated to Tan-E H4. 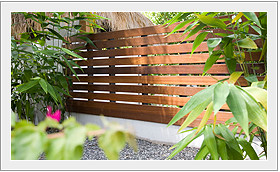 We are the Sunshine Coast exclusive distributors for OzzyBound Colourbond fencing. It is Australian-made with genuine Bluescope steel. We can supply certified power poles in Hardwood starting from 3kn to 20kn dia, and lengths from 8m to 15.5m long. Certified hardwood building poles are also available – different grades and diameters apply for straightness and durability. We stock a large range of logs in diameters of 100mm, 125mm and 150mm, with lengths of 1.8m, 2.4m, 3.0m and 3.6m. Wider diameters and longer lengths are available by order. At Ironbark Timber we employ a full-time wood machinist to cut custom bollards to your requirements. Bollards are available in domed top and rebated treated pine rounds. We stock CN Timber Oil (wood preservative) in both Heavy and Emulsion form in 2lt, 4lt and 20lt drums. This product is a supplement treatment for existing treated timber for all end cuts and rebates. The emulsion is an inground version and is thick like axle grease. It is also injected into bolt holes and other timber interfaces. Tanacoat is a UV stabilised natural finish decking oil. It is water repellent. Tanacoat penetrates deep into the surface and minimises blackening, cupping, surface checking, warping, splitting, splintering, swelling grain-raising, and cracking. We also stock and recommend Intergrain Ultra Deck, Mabons Timber Protection products and Flood company Spa-N-Deck finishes. Please call the Ironbark team for more information on timber products and finishes. 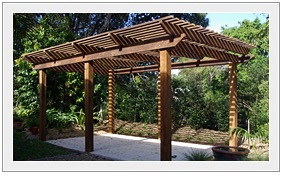 We custom order in all species and sizes of tongue and groove timber products. Please check with Ironbark about available species and width selection.